Despite the widespread belief that cheese is a most effective bait for mouse traps, mice probably aren't attracted to it more than many other animals. Yet we persist in encouraging the stereotype of the cheese-loving mouse. Mice with cheese are iconic in our society. In fact, the association is such an integral part of our culture that one popular restaurant chain even uses a mouse with the surname Cheese to promote its business. Like all mammals, mice feed their young milk. 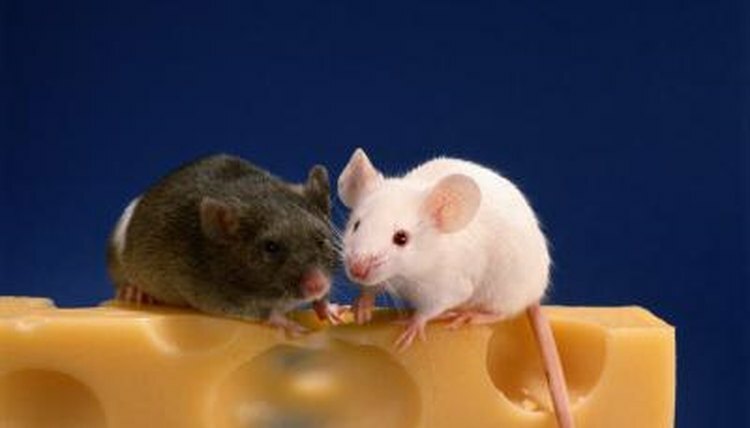 Since cheese is a milk product, it seems reasonable for mice to eat it, and they sometimes do. But cheese is essentially milk gone bad, and most animals instinctively avoid spoiled foods. Mice have a well-developed sense of smell, so cheese's pungent odor may warn them to avoid it in favor of fresher, more wholesome foods. In the wild, mice subsist primarily on grains, seeds, fruits, vegetables and insects, and they will likely seek those first in the pantry, as well. On the other hand, mice are opportunistic feeders, and when times are tough and favorite foods unavailable, they'll eat whatever is at hand. According to studies by UK scientists, mice are actually more attracted to sugary, high-carbohydrate foods like chocolate than proteinaceous foods like cheese. This is probably due more to a simple need for calories than gourmet tastes. The house mouse, Mus musculus, has long enjoyed a commensal relationship with humans because warm, dry homes stocked with food are inviting places for both species to live. This human/mouse association is indirectly responsible for the broad and sometimes bizarre diet of the house mouse, and the likeliest reason we associate mice with cheese -- a food they would not encounter otherwise. Among the items on the Mus musculus menu are all types of human food as well as paper products, tobacco, soap and even electrical wiring, often making them not only opportunistic feeders, but common household pests. On the plus side, they do eat bugs, as well. Just as elephants do not naturally consume peanuts and gorillas prefer leaves to bananas, the cartoon mouse eating cheese is little more than a contrivance to make us laugh. Real mice are small mammals in the order Rodentia, with families diverging into what we generally think of as wild mice, Cricetidae -- including deer mice and white-footed mice -- and the more familiar house mice, Muridae Mus musculus. Pet mice all derive from Mus musculus, which are far more interesting little creatures than mere cartoons -- with or without cheese. Is Chocolate Poisonous to Mice? Can Pet Rats Eat Radish Greens?